The competence of Goetze KG Armaturen has been in demand for more than 65 years. Our wealth of experience is as broad and varied as our areas of application for our high-performance fittings. Our well thought-out family of products covers every industrial application: Liquids of all kinds, gases, technical vapours and steam. 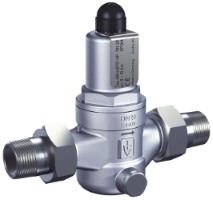 Goetze valves are used with temperatures ranging from -270°C up to 400°C and the greatest possible safety is a priority. We have the right solution for you: Take us at our word! We have been designing and ­manufacturing safety valves for a highly diversified range of applications for over 65 years. With over 300.000 valves per year “Made in Germany”, we are your competent partner for all matters relating to the handling of pressure. Our team of consultants who come to you. We are your competent advisor and partner for technical solutions with experience and professional know-how. Flexible structures mean that the route to a customized product is short. With our technical expertise we realize new and enhanced designs in the shortest time possible. The “work station”: manageable units, short set-up times and employees with the necessary know-how, skill and experience. Not any anonymous assembly line production. We are always proud to hear when the Goetze KG is referred to as a “manufactory”. Intelligent minds and skilled hands are the one thing – however for the manfacturing process at Goetze KG nothing can beat the highest level of precision achieved through the use of high-tech production equipment: Computer controlled CNC machines. In order to fit all the necessary information onto the valve, we use precision laser marking technology. This means that we are also able to take individual customized marking requirements of customers into consideration. You can rely on this: Every single valve is tested in our factory. This is not only a random spot check: Each valve is subjected to an ISO-certifed quality control test, before it is allowed to leave the factory.